There’s a lot of wonderful food to eat in Singapore. 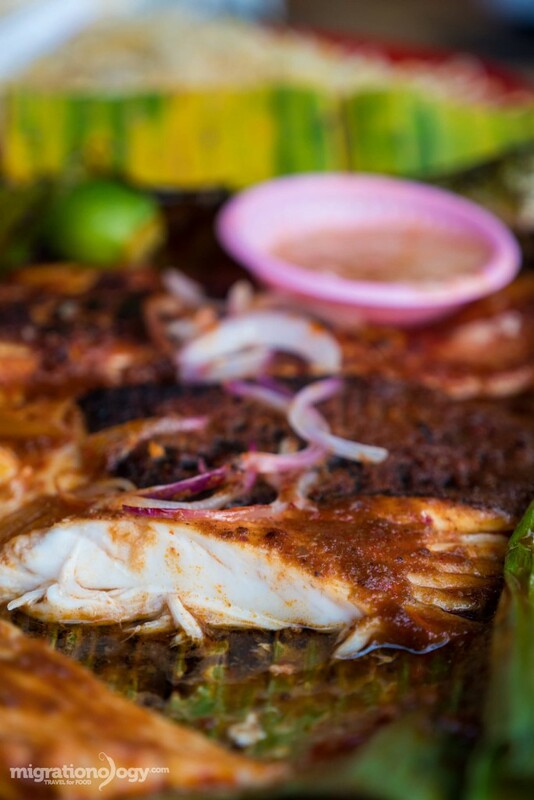 But one of the dishes that I can’t get enough of when I’m in the city is bbq sambal stingray. 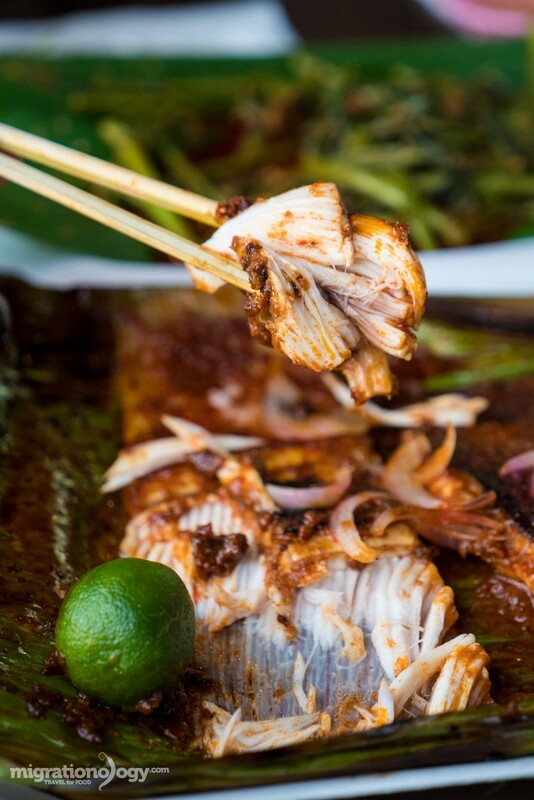 The slices of stingray are generously lathered with sambal chili sauce, wrapped in a banana leaf, and steamed and grilled at the same time. You’ll find bbq sambal stingray at various seafood stalls throughout Singapore, but one that I really enjoyed going to was Chomp Chomp Food Centre. 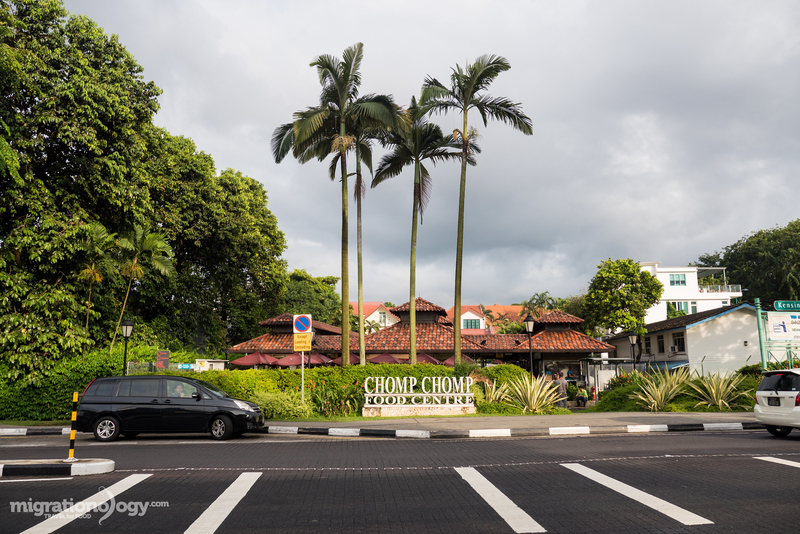 Located a bit north of central Singapore, in a lush neighborhood residential area, Chomp Chomp Food Centre is a wonderful hawker food paradise. 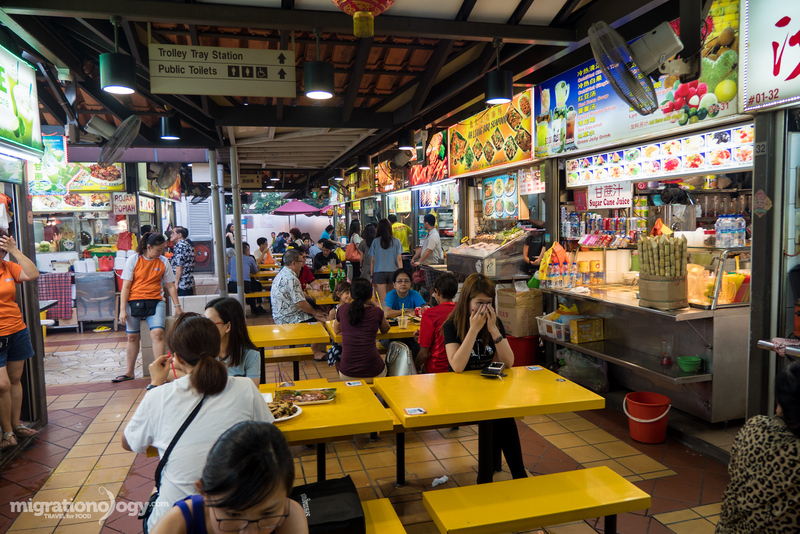 In comparison to other food courts in Singapore, it’s pretty small scale, but the stalls available are of great quality – in other words, once you get there, I don’t think you can really make any bad food choices. 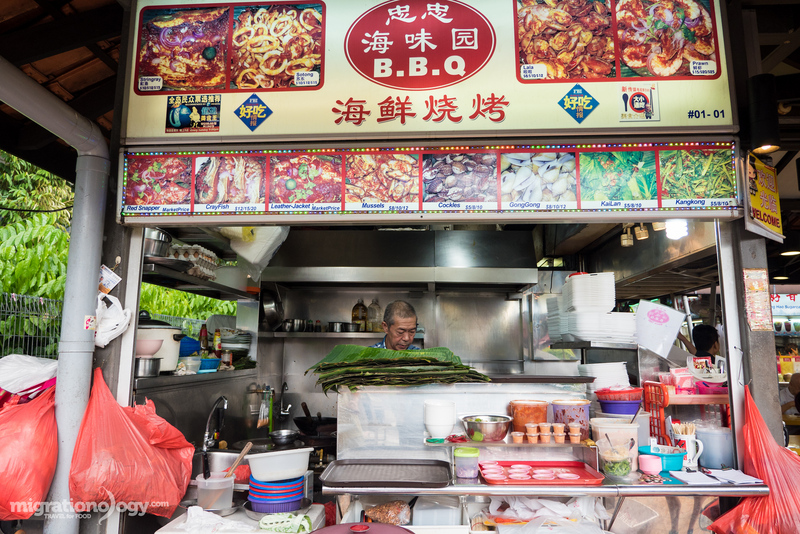 There are a number of seafood hawker stalls, where you can get a variety of fish, prawns, and squid, either grilled or stir fried, and there are also a number of stalls that serve roasted chicken wings. 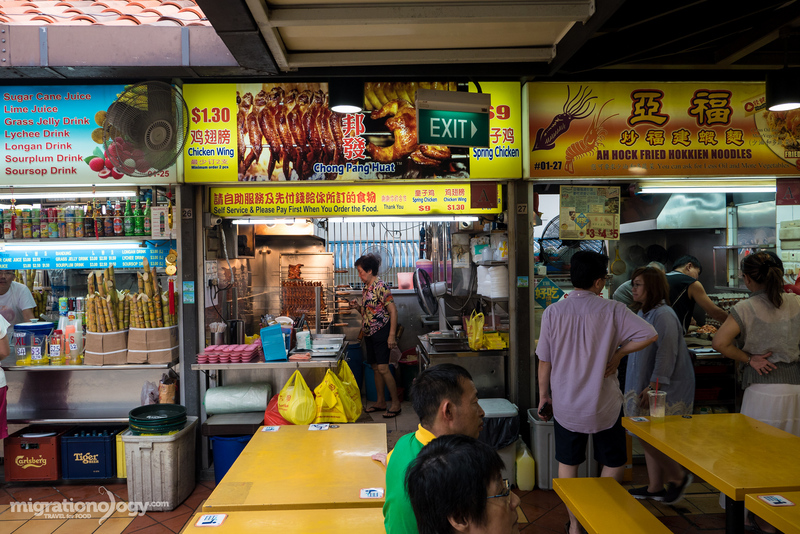 Additionally, you’ll find other hawkers selling classic Singapore dishes like Hokkien mee and carrot cake. On top of a delicious selection of food, Chomp Chomp Food Centre is just a friendly, laid back, and inviting style of a food centre. There are some tables at the front entrance, and then throughout the market there are more tables. Just be warned that if you come to Chomp Chomp on a night at peak dinner time, especially on the weekends, it can be packed and hard to find a table. My wife and I arrived at about 5 pm, and luckily we beat the evening rush, and found a table at the front of the food centre. To get things started, I went to a stall called Chong Pang Huat. The lady there was nice and friendly, so I thought it would be the perfect opportunity to get a plate of freshly roasted chicken wings. The wings were on a spit, rotating over hot charcoal and they were glistening with their golden color. Chicken wings are commonly available at hawker food centre’s in Singapore, and they make a great pre-meal snack. The chicken wings here were every bit as good as they looked. The skin was roasted so it had a gooey crunchiness, and they were marinated in a sweet and slightly tangy soy sauce. The taste of the chicken wings sort of reminded me of char siu, with a sweet roasted flavor. Additionally, they were served with a chili sauce on the side to make things ever better. Another popular hawker stall at Chomp Chomp Food Centre is Ah Hock Fried Hokkien Noodles, specializing in Hokkien Mee. 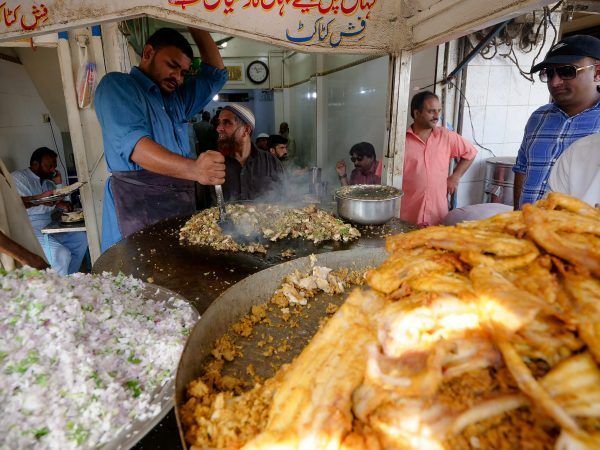 It’s one of those stalls that continually has a line of people ordering to eat there and for takeaway. 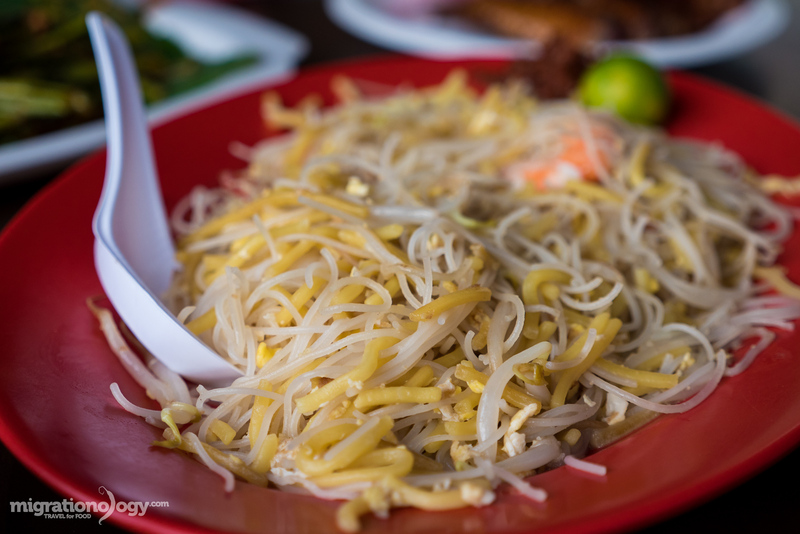 When it comes to fried noodles in Singapore, Hokkien mee is one of my favorites. I like that it’s flavorful without being oily. 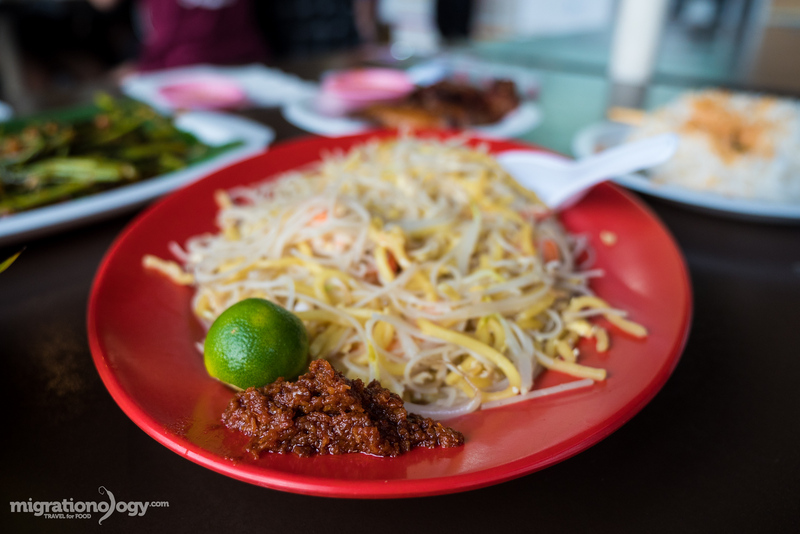 The Hokkien mee included both yellow noodles and white rice noodles, stir fried with lots of bean sprouts, and some pieces of squid and shrimp. 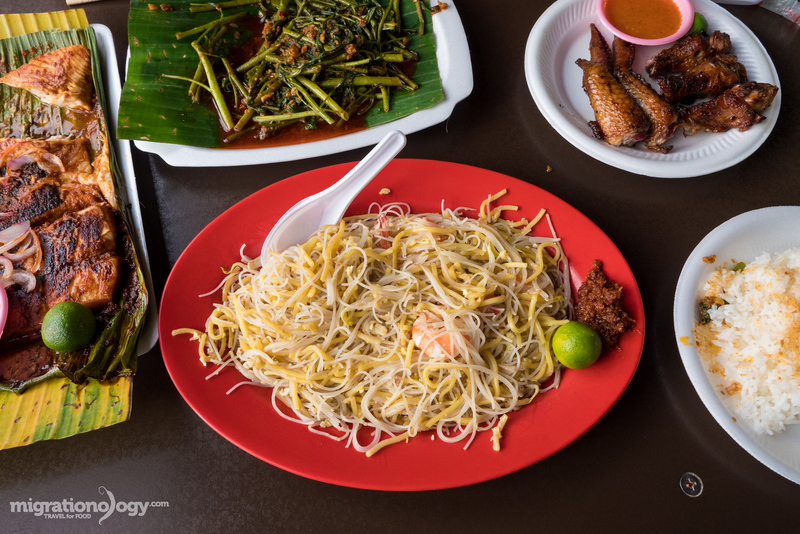 Some have commented to say the Hokkien mee at Ah Hock is a little on the dry side, not enough gravy sauce like some versions, but it really depends on your preference of how you like it. I thought it was pretty good, especially because I ate it along with my piece of bbq sambal stingray. Singapore Hokkien mee would not be nearly the same to me if it wasn’t served with a slice of calamansi and a spoonful of sambal chili sauce. The squeeze of calamansi, which tastes kind of like a cross between lime and orange, gave the noodles a nice citrusy touch, while the addition of the chili sauce, which I think included some shrimp paste, completed the taste of the noodles. Ok finally, let’s move onto the main dish that I came to Chomp Chomp Food Centre to eat: bbq sambal stingray. There are a number of seafood stalls at the food centre, but when I asked where to eat in Singapore, the first stall #1, right at the front of the food centre, was the one many of you recommended. So that’s exactly where I went. For the sambal stingray, they had a choice of a piece for $10 SGD, $12 SGD, or $15 SGD. There was nothing I could do from not ordering the biggest size. I also decided to order a plate of sambal kangkong, water morning glory stir fried in sambal chili sauce and shrimp paste. In order to cook stingray, it takes good timing. Overcook it and you run the risk of it being dry, rubbery, and losing flavor, but you don’t want it raw either. 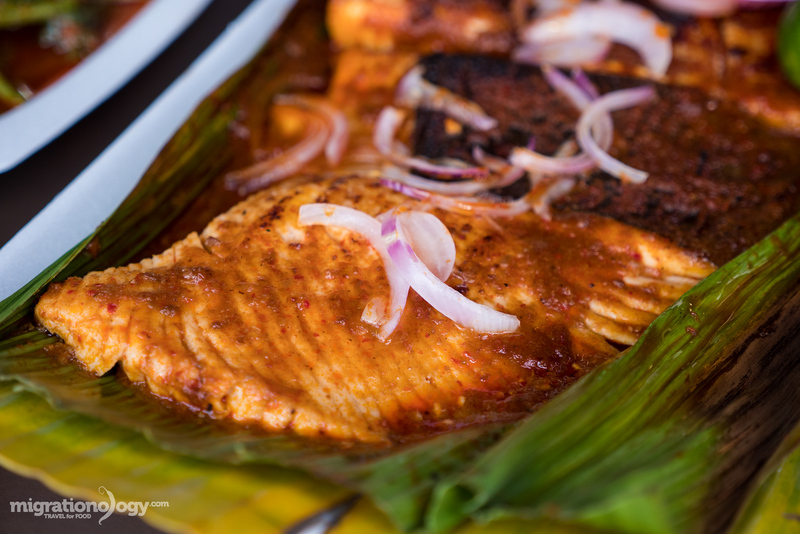 The stingray was seasoned with a thick layer of sambal, and then wrapped in a banana leaf. They didn’t use charcoal, although I think it would have been even better had they done so, but instead used a hot surface. 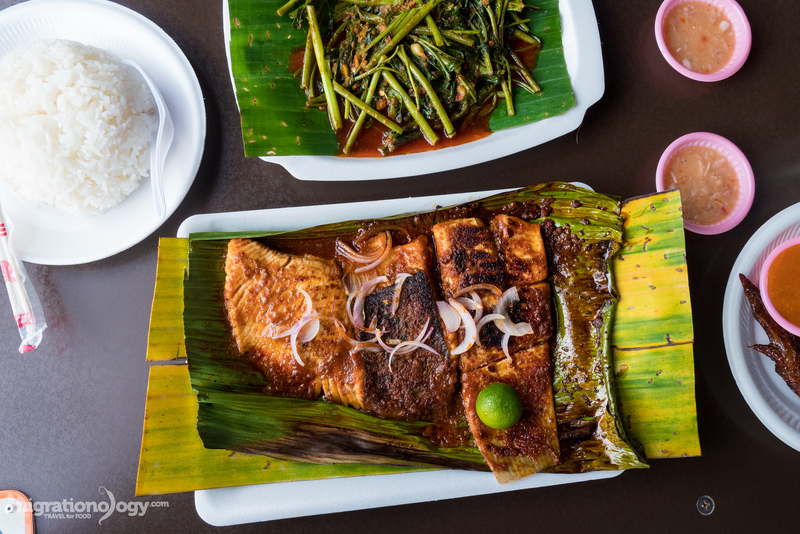 Within the banana leaf wrapper, the stingray sort of steamed, baked, and grilled all at the same time, the banana leaf and a metal lid was used to keep all the moister and flavor within it. It took about 10 minutes to cook, and the aroma of the roasting chilies, shallots, garlic, and shrimp paste could be smelled throughout the entire food centre. Finally, when the stingray was done cooking, a handful of sliced red onions were added to the top for garnish. Some of the sambal on the bbq stingray was caramelized, and other parts were more saucy, and the entire packet had a wonderful banana leaf green roasted aroma to it. The stingray was also served with calamansi and a side of shrimp paste dipping sauce. Stingray has a texture that’s somewhere in-between chicken and fish. It’s quite firm and stringy, yet it’s very juicy and soft all at the same time. 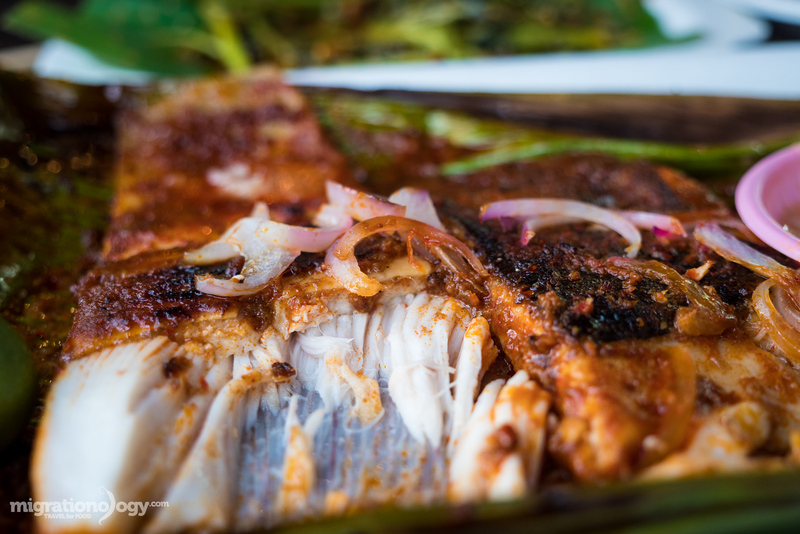 The taste of stingray is quite neutral, it doesn’t have a fishy taste at all; So that’s why the sambal and the bbq flavor of the banana leaf really stand out so much. The sambal wasn’t spicy, but you could taste the dry chili flavor, and it was lightly sweet from palm sugar, plus fragrant from lemongrass, garlic and ginger. I think there may have been some tamarind in this recipe too to give it a bit of tanginess. What really tasted good, were the bits of the sambal that had been charred to give the stingray a beautiful smoky taste. I could eat bbq sambal stingray everyday in Singapore, and it was incredibly delicious at stall #1 at Chomp Chomp Food Centre. 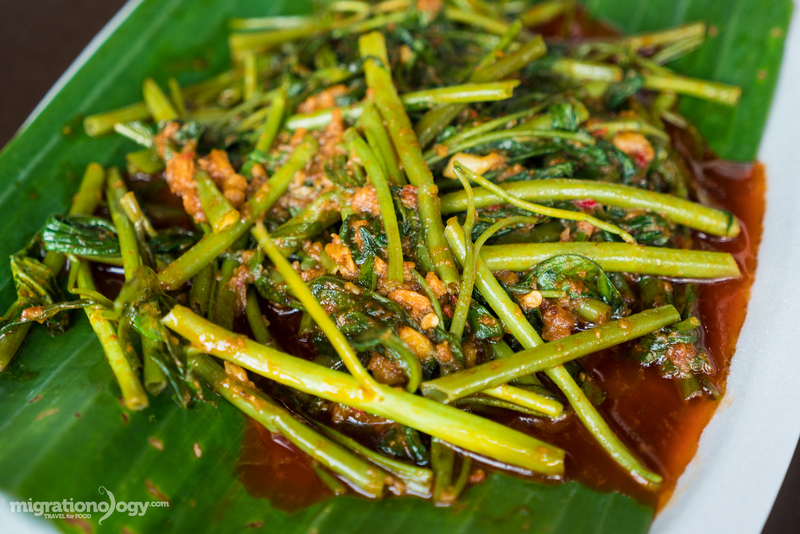 The sambal kangkong was also really good, stir fried in a lot of chili sauce and shrimp paste. It was sitting in a pool of oil, so it was pretty greasy, but it was still good. The water morning glory remained crisp and fresh, and just fully coated in shrimp garlicky chili goodness. There were a lot of foods that looked incredible to eat at Chomp Chomp Food Centre, but just being my wife and I, we were happy with what we chose. If you have a few minutes, press play to watch the video below to see Chomp Chomp Food Centre and this delicious bbq stingray. Chomp Chomp Food Centre is a laid-back hawker food court in Singapore that is especially well know for serving seafood bbq. When I was in Singapore, I went to Chomp Chomp with a main purpose to eat one of my favorite Singapore dishes: bbq sambal stingray. 25 Must Eat Singapore Foods! The bbq stingray was excellent, very meaty and firm, and caked in tangy roasted sambal chili sauce. If you’re ready to eat fantastic bbq stingray and a nice selection of other Singapore hawker dishes, in a friendly neighborhood atmosphere, Chomp Chomp Food Centre is a great place to go for dinner. Open hours: Although many of the hawker stalls at Chomp Chomp have their own unique hours, the general opening hours are daily from about 5 pm – 12 am midnight or so. So it’s only an evening / night hawker centre. How to get there: Unfortunately Chomp Chomp Food Centre isn’t right next to an MRT station. The closest MRT is Serangoon, which is still pretty far, about a 30 minute walk. Alternatively you can catch a bus from outside the Serangoon MRT station to Serangoon Gardens which is next to Chomp Chomp. 42 comments. I'd love to hear from you! Everything looks awesome! Congratulations for sharing this with us! 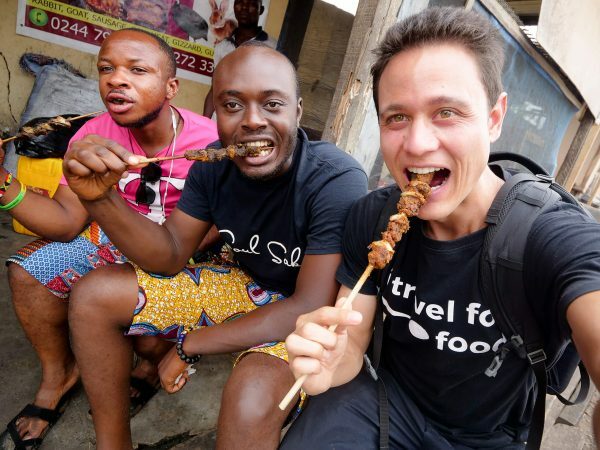 Love your videos, you so make me wish I had the money and the freedom to travel the world and eat. Hey Jerry, thank you for reading and your input. Our family love watching your videos, and were amazed to see you walking right past our Serangoon home in this one! Hey Daniel, haha, awesome to hear that, thanks for sharing. Greetings to your family! Hey Mathew, glad you love the food in Singapore too! Chomp Chomp Food Centre, the name itself is so amazing..
Really loved it Mark, I like to have my food on a banana leaf that really adds the taste to the food, I feel very happy when somebody serves it on a leaf. this seems really cool, will have to plan when I visit Singapore. 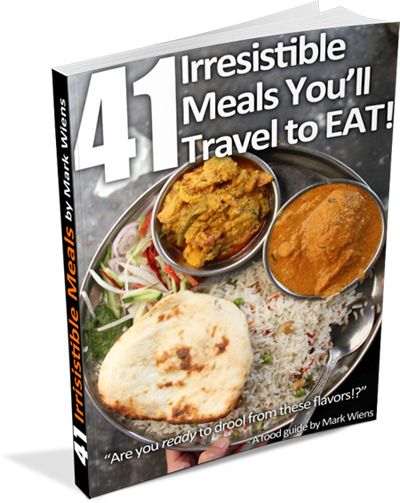 Hey Mark, thanks for featuring one of my favorite food center in Singapore! I was there about 2 weeks ago too, with my partner, home for a vacation to see family, and we ate there too. Your selection was spot on! 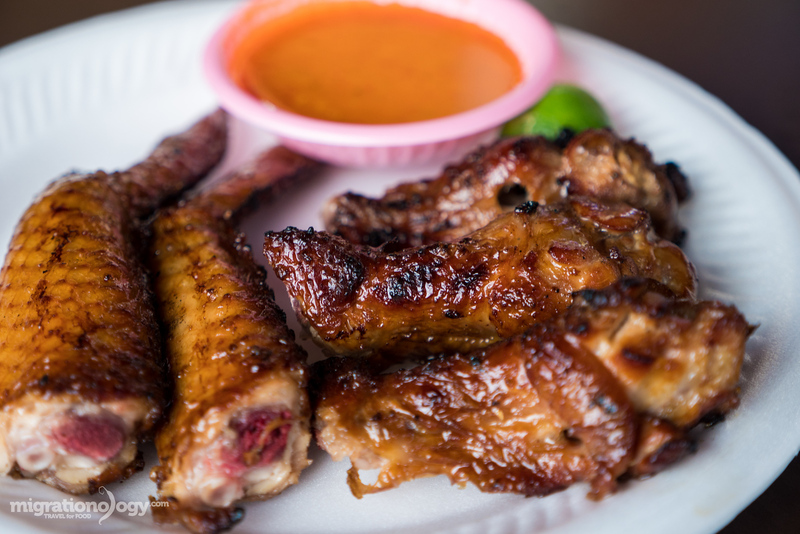 Chomp Pang Huat is the best chicken wings you can get around among all the other stalls. It was sold by an old couple, and occasionally their son will help out. There is just this something about their recipe that taste so good compared to the others! If you get a chance in future you have to try the carrot cake, their stall is the first, right towards the front of the food center. It’s one of the more special ones that they make their carrot cake fresh everyday and they add mini shrimps in the dish if you ask for spicy. Once they sell out of their carrot cake they will close out for the night, no exceptions, so you will know your dish is guaranteed fresh and yummy! You sure know how to make food look delicious! The photos are magnificent and dishes are generally fantastic . I’m planning to go to Singapore in September . Thanks for the great help. Hey Marcelo, thank you, glad you’ll be visiting Singapore soon. Amazing guide! I am planning a group trip to Singapore and this is just what I needed. Your photos are great as always! Hey Vincent, thank you very much, hope you can visit Singapore soon. Looks so yummilicious! Excellent pic of the presentation which ignited my hunger pangs. Not sure when my next visit to Singapore will be, I am making a note of this place nevertheless. Thank you very much Indrani! Wish I had known you were in town as would have loved to show you around. I actually live 5 mins away from Serangoon MRT station, the station you got off for Chomp Chomp. Anyway assume you’ve left town but if you’re still here, email me. If not next time for even more fab places to eat. Hey Richard, thank you very much for the invitation. Ah yah, we’ve already left, but will let you know when we come back again. Thanks! 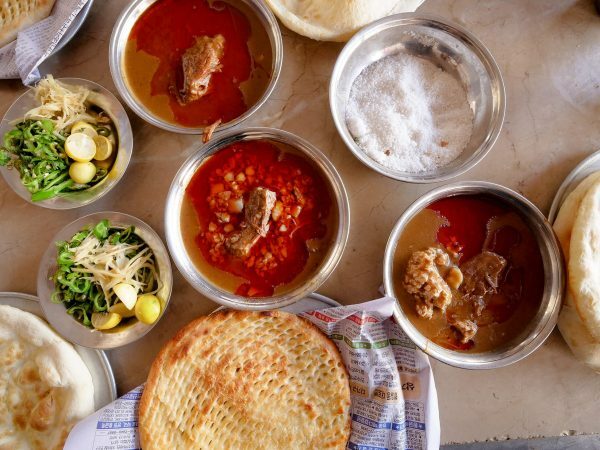 We also serve intercontinental foods at our hotel. Hotel happy home Nepal. Awesome job as usual, Mark. Hey Emilka, great to hear from you, thank you for reading and watching the video. Singapore is a great food destination, and there’s so much food in every food court – it’s sometimes hard to choose what to order. There will be an upcoming video about Singapore carrot cake. It’s much different, made with radish cakes, and not sweet. I’m kind of surprised to see stingray! The way you describe it as a neutral taste between chicken and fish makes me want to try it, though! Ok, so do you speak Mandarin or do you go with a guide? How did you know cooking stingray was all about timing? That seems like you’d need quite the chat with the cook – hard to do if he’s a local! It’s not necessary to speak mandarin in Singapore, everyone here speaks English. Also, I’d love to be shown around if I ever find myself in Singapore – I don’t doubt the city is easy like Mark said, but locals and living-there expats always know the best places! Thanks for the offer dzubmarinara! Hey Vanessa, thank you very much, hope you can try stingray. For Singapore, while Mandarin (of Chinese dialects) are widely spoken in Singapore, most people still speak some English, so you don’t need to know any other language. For the seafood restaurant stall #1, their sign was in Chinese, but the owners spoke English. You’ll have no problem. Singapore is really an easy city to get around and navigate. By the way, a cool tidbit of info is that Mandarin is referred to as 中国话 here in the country, even by those outside of 北京. That’s almost literally translated as China (the country) language. I’m not so sure Mandarin rather than Chinese is politically correct inside China. Could you imagine people referring to US English as American of English dialects? Sounds funny to me. Food for thought for sure as China becomes more globally involved, at least in media. Hey Vanessa, thank you very much for sharing, very interesting, appreciate it! I LOVE BBQ Stingray. We haven’t had it the last few times we were in Singapore, but we will be there for a short trip next week. Hopefully we can squeeze it in! Hey Amber, glad you love stingray too. Have a good time in Singapore!